At the age of 15 I became a teen mother, so not being involved in education was not an option. By the time I was 19, I had three children, two jobs, and was still in school, because not having a high school diploma was not acceptable in my household. My mother was a PTA mom, and as much as I hated her being a part of my school culture at the time, I’m glad she was. She told me I had to be there and serve on the PTA for my children, just like she did. And although I didn’t want be like her, I was forced to because of my children. Mollison Elementary is our neighborhood school —the foundation of my community here in Bronzeville. I attended Mollison with my cousins. It was a home away from home for me, so I wouldn’t dream of sending my children anywhere else. My grandmother was one of the first teacher’s assistants at Mollison. It’s only appropriate that since Mollison gave me my foundation, I send my children there, and, at 19, I started to serve on the local school council. I quickly began to notice that, even though I was on the LSC, my children were not getting what I got when I attended Mollison. Yet the LSC was always the “fall guy” for why schools underperform or fail. The part of the story that is never told is that LSC members are improperly educated on how to be strong school advocates. Still, I continued on the LSC and have been ever since for a total of 21 years. I also started to notice that Black and tenured teachers — those who taught me — were mistreated and being rapidly fired. Meanwhile, my neighborhood was changing. Public housing was going down and not being replaced. Stores and businesses disappeared, and the institutions I grew up with were vanishing. Around 2000, CPS officials wanted to close Mollison — while condos were going up where public housing used to be. Mollison had little district support, but despite this, was in the middle academically. As a parent I couldn’t understand how an unsupported school could be deemed “failing” and slated to be closed. We pressured Dorothy Tillman, our Alderperson, and with her help, Mollison was spared, but we never received the resources to be a quality neighborhood school. 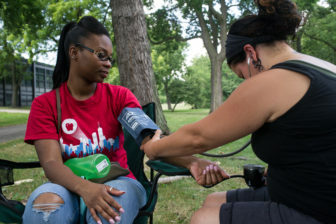 On Day One of the hunger strike over the future of Dyett High School, nurse Maria Olsen takes the vital signs of CPS teacher Monique Smith. s unsatisfied being on the LSC and not really knowing what was happening and why. I needed to understand LSC policies and started to attend LSC education sessions. I learned that Mollison’s story was similar to some other schools around Chicago — those serving Black and Brown children. The workshops helped identify problems we faced and helped create solutions. I was so impressed with the brothers and sisters facilitating the sessions that I joined the organization — the Kenwood Oakland Community Organization (KOCO). I had never been so inspired to be around people who were unapologetically Black and educated. I began to attend meetings and organize with KOCO to combat educational inequity in South Side schools. For a long time, I had felt I was struggling on an island, not noticing that we needed to get together to help each other. After CPS’ 2009 attempt to close Mollison, I couldn’t take it anymore. I realized that we couldn’t continue to say “don’t close schools without having a vision.” It was apparent that CPS had no plans or vision for schools in our neighborhoods. So with KOCO’s help, we started to gather parents to dream and answer the question: “What do we want for our schools?” The funny thing was that we parents essentially wanted the same thing. This let me know that good schools are no mystery and if we fight together, we can get the kind of education for our children that we once had. We had countless meetings with students, parents, and community members to get input on what their schools should look like. This dreaming birthed a plan for Dyett High School and five feeder schools — the “Bronzeville Global Achievers Village” (BGAV). Cathy Dale on the fourth day of the strike, Aug. 20. But we didn’t realize that in back rooms, CPS was looking to close more schools in Black and Brown neighborhoods. In 2012, CPS voted to phase out Dyett and close some of its feeders — this disrupted our plan and hurt our spirit. We were left with the hard decision, whether to go forward or retreat — because the same appointed board and elected officials were against us. Did we have the will and the fight to keep going? We did. In 2013, after a Board member told us that our BGAV was a “wish list,” we formed the Coalition to Revitalize Dyett High School. Dyett was the last open-enrollment neighborhood high school in our area — what we have are selective-enrollment and underperforming contract and alternative schools. We pressured CPS to reverse their decision and not close Dyett, but they did not accept our plan, threw us a curve, and opened up a proposal process for Dyett — they refused to believe that ordinary/extraordinary folks could come up with a world-class educational plan for a school in our own neighborhood. It became clear to us that after six education forums, 2000-plus signed petitions, and the support of LSC members, parents, teachers, and professional educators, it had nothing to do with whose plan was best but with who was well connected with the Mayor. The last straw was when CPS violated its own rules. Two proposals were submitted on time, but then CPS accepted a late proposal. At the CPS-organized forum in June 2015, over 75 percent of community speakers supported our coalition’s plan. Still, Alderperson Will Burns said that he wouldn’t support our plan, even though we did everything CPS requested and much more. When CPS cancelled the August 10 public hearing — the last planned hearing on the proposals before a scheduled August 26 School Board vote [subsequently moved to September] — with no notice, we drew the line in the sand and said no more. 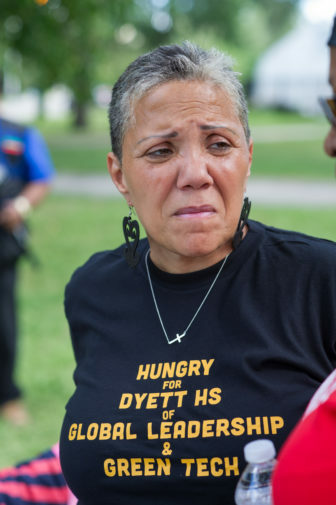 And so a week ago I became a hunger striker for the Dyett Global Leadership and Green Technology High School. 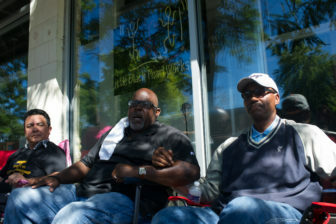 On Monday, the 8th day of the strike, (from left) Nelson Soza, Jitu Brown and the Rev. Robert Jones outside Little Black Pearl Art and Design Academy, which has proposed a competing plan for Dyett. I never wanted to be in front of a camera. All I wanted was to be part of my kids’ education and be part of the solution. I just wanted to drop my children off and know that they would be educated the way I was. But I found every day that that was far from the reality. I now want children in this city and country to know that there are people out there fighting, willing to go hungry — for them. In a perfect world there would be no racism, and I would not have to challenge people by calling out their racism. I was brought up in church and taught that we must love everybody. But how can I love people who see my children and me as numbers, as a way to profit from us. I can’t wait for superman. I know we are the people we have been waiting for. Jeanette Taylor-Ramann is a lifelong Bronzeville resident, mother of five and soon-to-be grandmother. She has served as a Local School Council member at Mollison Elementary for 21 years and currently is its chair. She is a parent organizer at the Kenwood Oakland Community Organization and member of the Coalition to Revitalize Dyett High School.